This Sunday – for a change – let us walk over to the ancient Rag Fair in Houndsditch. In 1503, when Houndsditch was first paved over, it was already the haunt of brokers and sellers of old apparel. Ben Jonson refers to it in “Every Man in His Humour,” first performed at the Curtain Theatre in Shoreditch in 1598 - Wellbred: Where got’s thou this coat? Brainworm: Of a Houndsditch man, Sir, one of the devil’s near kinsman, a broker. The anonymous writer of “Wonderful London: its lights and shadows of humour and sadness” 1878 has offered to be our guide, but beware, I am informed “there is an atmosphere about old clothes rather distasteful to the uninitiated nostril.” Yet we must accept the stench, because we shall have no other opportunity of visiting this lost market which disappeared over a century ago – superseded by the charity shops. vintage clothes stores and online auction sites of our day. 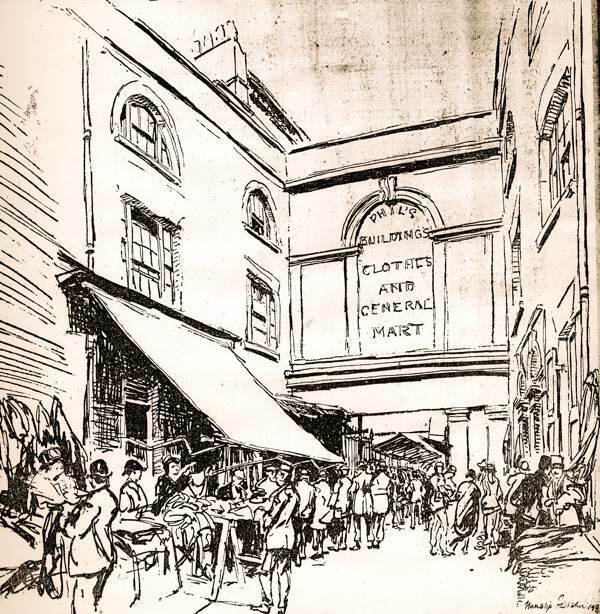 Summer and Winter and all year round, there can be found nowhere such an uproarious assemblage, such a scene of buying and selling, of bargaining and bating as takes place at what is almost the heart of the City of London – at the Rag Fair, in a triangular patch bounded by Houndsditch, Leadenhall St, and St Mary Axe. At the back of the tall houses of the highway are the narrow ways, the filthy lanes and the the tortuous alleys, the open squares and the roofed-in spaces, the mighty domains of “old clo,” the headquarters of cast off habiliments, and of tatters and flinders, a shade too good for the rag merchants – coats, waistcoats, trousers, shirts, socks and stockings, and all manner of female skirts and frippery and finery, which have passed through the desperately ingenious hands of professional renovators and patchers and “translators” and cobblers, and made to appear as though fit for another spell of active service, or at any events, preferable to the utterly worn-out apparel of the poor wretches who come to the old-clothes fair on a Sunday morning to make their halfpenny bargains. And let it be understood that “twopence-halfpenny,” as it is used here, is not a figure of speech but a grim fact. With the rest, we push our way through the dense crowds that throng Cutler St, and the Old & New Clothes Exchange, and Phil’s Buildings and Moses Sq. 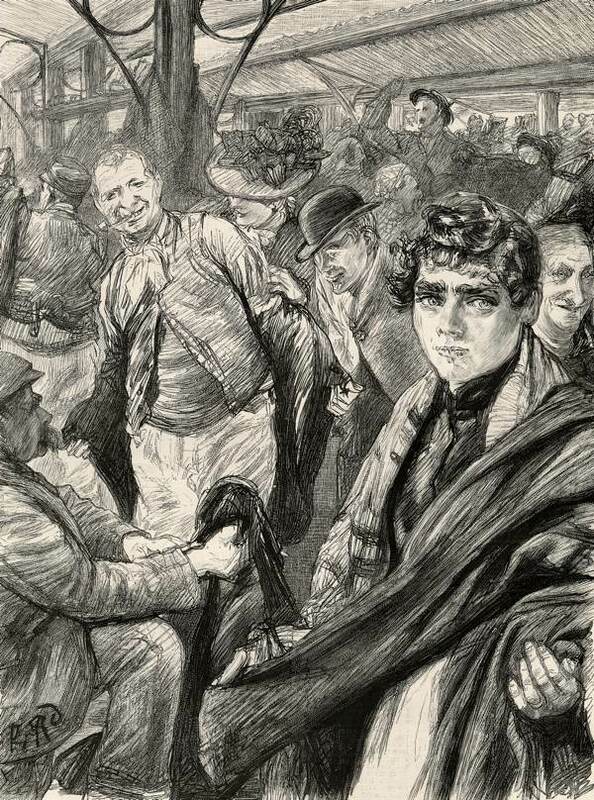 I can say to you that I had been hard up for a waistcoat – very hard up, I mean, of course – and had but fourpence in the world to provide the urgent requirement, I might buy one here and come away with three-halfpence to spare, with which to treat myself to a glass of beer on the strength of my bargain. I might have purchased a pair of not so very shabby side-sprung boots for sixteen pence, and had I been in want of a tall hat, there is a vendor of these articles with a great bunch of them held above the heads of the mob at the end of a clothes prop – a judicious arrangement and one which saves them from collisions of a crushing and ruinous nature – and I might have fitted one to my head on the spot for the trifling sum of ninepence. And then comes the oddest and, considering the enormous difficulties, the most wonderful part of the trafficking. 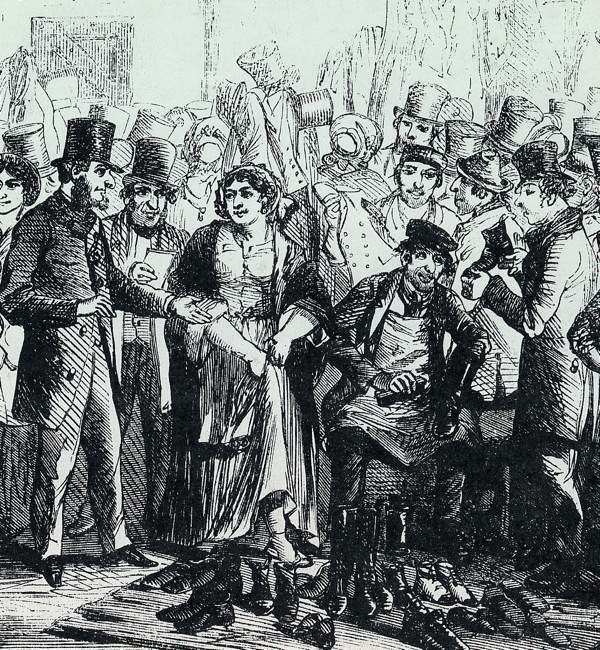 In a dozen different spots, within twice as many yards, may be seen men and lads, provokingly scant of elbow room, struggling to divest themselves of portions of their attire and sell it, for all the world as though so many offhand pugilistic encounters were imminent, while others are down on their knees in the mire, fitting on the patched old boots, acknowledgedly but a few pence better than the wrecked rags of leather they are meant to supersede. In due course, we find ourselves in the theatrical costume department. No matter what the newly fledged actor may be in search of he will find it here. Elizabethan “shapes,” “square-cuts,” burlesque and pantomime dresses, doublets, trunks, tights, fleshings, russet and velvet shoes, uniforms, swords, daggers, pistols and wigs of every description. To comic singers, this section of the Rag Fair commends itself as a very treasure trove when in quest of eccentric stage attire. Indeed, it is not uncommon for half a dozen of the most popular artistes of the music hall to be recognised in the Rag Fair on a Sunday morning. Hither, too, come restaurant and coffee room waiters to buy themselves a dress coat when their old one has become too shabby for respectable service. Enterprising tradesmen, desirous of imparting an additional respectability to their establishment come also, to fit their errand boys with a cast off page’s suit. But let us not tarry here. Around the three sides of this emporium of old clothes are long pegs literally groaning under the weight of old coats which have seen better days, but which for aught one knows may have been worn by the wealthiest in the land. At all events, many betray evidence of having been made by a fashionable snip. In front of these, on a raised platform, are piles of vests and inexpressibles, neatly folded up, as if they had just been handed down from the shelves of a clothier’s stall. 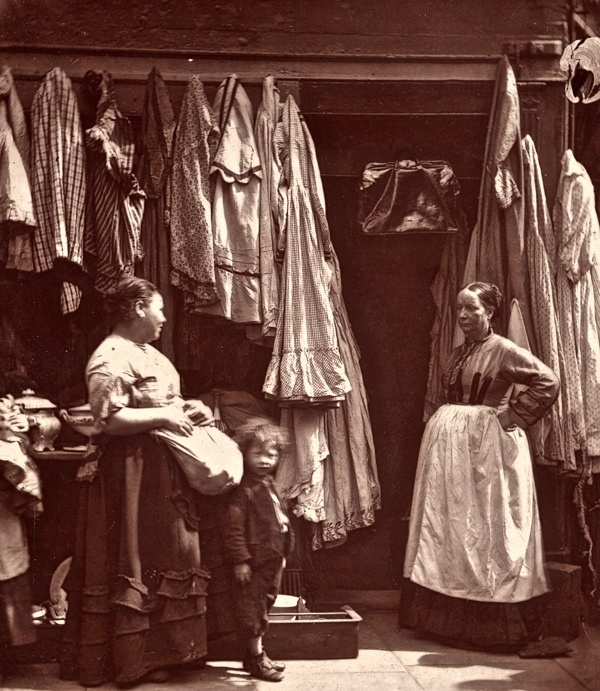 We have picked up more slang in the course of a couple of hours study of life and character around the City Clothes Exchange than could be gleaned during a month’s residence among the costermongers of Hoxton and Bethnal Green. But then, the Rag Fair is scarcely where one would expect to become imbued with lofty ideas. Phil’s Buildings & Clothing Mart consisted of four houses, two on each side, packed to the roof with old clothes of which a large proportion were put on sale and disposed of in the mart on Sunday mornings. I expect numbers of your readers are now condemned to spending their Sunday unable to escape humming the radio advert of the successor to the Rag Fair, the Houndsditch Warehouse. This was a large Jewish run department store which opened on Sunday and where we, as a family, did a fair share of our shopping. I especially remember the shoe department. It wasn’t a fancy place, like the long lamented Gamages, but it had no frills bargains which appealed to working class East End families like ours. But that radio jingle that seemed to be played endlessly on Capital Radio – a real earworm! It’s funny you should say that Joan, as the first thing that came to my mind was the Hounsditch Warehouse ads on Capital Radio. I had no idea where it was and assumed it was out Hounslow way, so was very confused when I eventually moved there not to be able to find it! Glad to have ended the confusion, CC, but sorry to have revived memories of the radio jingle! 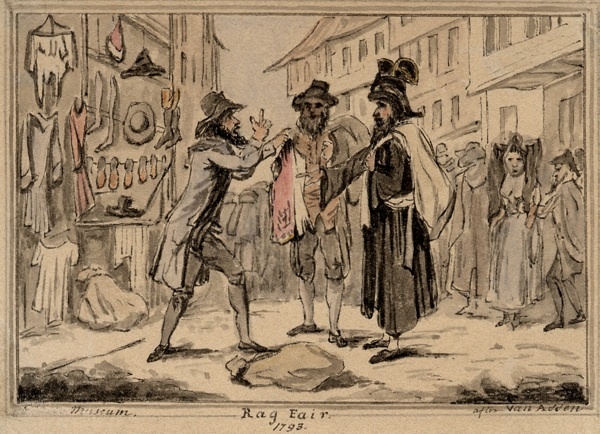 Does anyone know whether there was a pub called The Yorkshire Grey in Rag Fair at any time around 1740?